An enjoyable read with an important message about the value we give to life, what we do with our lives, and what we’d be ready to sacrifice to extend them. Confronted to the prospect of dying very soon, in the next few months if not the next few days, the narrator is offered a bargain by the Devil itself, and a tempting one at that: for each thing he erases from the world, he gets to live one more day. Which quickly raises a lot of questions and conundrums, because if it’s worth earning more life time, it has to be a sacrifice… but if we sacrifice too much, is it worth keeping on living? 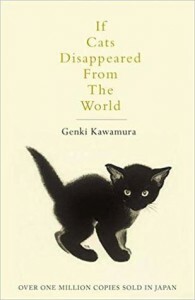 The chapter with the talking cat was well done, too: first because of the cat’s voice, second because he was very… feline (those bipeds never understand anything to cats, do they? ), and third due to his selective memory, something that was sad, but also a reminder that we don’t know how animals think, and what we take for granted may not be what is important to them.